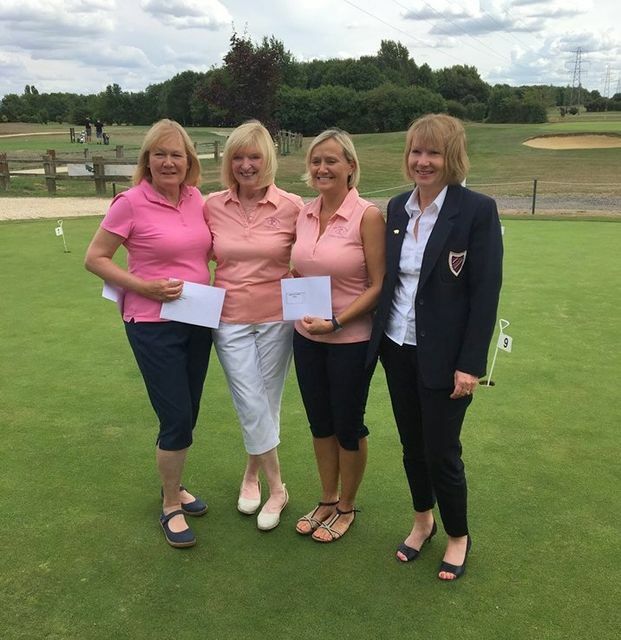 The winning team of Jacky Watson, Carol Hughes and Jenny Garland from The Kendleshire pictured with Vice President Vicky Watkins. This competition is only in its second year and was set up to include some of the smaller clubs who are unable to host a major competition. There was a nice relaxed atmosphere in the clubhouse as County Delegate, Viv and Club Secretary, Nigel helped me set up before the ladies began arriving. I even had time to have breakfast before welcoming the first teams. Nigel was the starter and Viv, the maid of all work, dealing with queries, ball draw and selling pig markers and pins whilst I ensured the ladies had cards and other information. On arrival, everyone commented on the lovely coffee and bacon baps and relaxed atmosphere before tackling an interesting 9 holes trying to improve their scores on the 2nd 9 in dry, warm weather yet again. Scores were close and countbacks kept Viv and myself busy checking until all were in, just before County Vice President, Vicky arrived to present the prizes as the last ladies enjoyed the delicious buffet provided by Sherdons.